Viviana Peretti's strikingly fluid images in Dancing Like a Woman captivated the 2014 Sony World Photography Awards Honorary Jury to grasp 1st Place in this year's Arts & Culture category. Following on her win, we spoke with Viviana to learn a bit more of the background behind the winning series, as well as the personal depth behind her work on the whole. Tell us a bit about your background. You originally pursued anthropology before turning to photography, yet it seems this has played quite a role in the ways in which you pursue your stories. How did you make the transition? Originally, I started studying biology in Rome with the idea to work on environmental issues but I rapidly got bored with so many things to memorise (formulas, theories, etc.). So I switched to Literature and Philosophy and ended up studying History and Anthropology. I graduated with a thesis in History of Religions titled ‘The End of a World. Deculturalization and Sincretism in Latin America’, and I got a scholarship for both Colombia and Peru. Without knowing too much about the country, I decided to travel to Colombia to pursue a PhD in Anthropology to study an indigenous community in Putumayo, on the border with Ecuador. However at that time, March 2000, there was an armed strike organised by the FARC (the leftist guerrillas) in the south of the country and the university didn’t allow me to travel. That’s when I got involved with photography and, instead of doing a PhD in Anthropology, I spent two years in the darkroom at the Universidad de Los Andes in Bogota. Since then, I’ve never stopped taking photographs. Many people who are familiar with my photographs say that is quite obvious that I am an anthropologist. I think anthropology gave me a different way to relate to and analyse things, especially when I am on the streets of a new place and I respond more in an emotional than in an intellectual way. But probably there are things that I am able to see, identify and frame also thanks to my background as an anthropologist. There are subjects that interest me – sexual orientation, religion or how people relate to death – that are really connected to my past as an anthropologist and to my personal life. You ended up working as a freelance photojournalist in Colombia for nine years. What prompted your choice to freelance and what is it that keeps bringing you back to the region as an area of focus? Colombia has been a revelation for me on so many levels. It is the place where I first got involved with photography, a kind of secret love that I had never pursued before. In Colombia I finally understood and assumed my homosexuality and it was an incredibly liberating experience. I will be forever grateful to the country and its people for allowing me to grow and be the human being I am today. I think I felt free like I never felt before. Free from social conventions, free from family’s commitments, free to be who I am without denying or hiding myself. I spent almost ten years in Colombia but one day I just felt overwhelmed by the chaos, the total lack of rules, the abuse of human rights, the impunity, the double moral of many institutions, the incapacity of the government to ensure basic rights to its people, and I understood it was time to move. The country didn’t change since my arrival in 2000 but I couldn’t stand it any longer. I left everything behind and invested all my savings challenging myself to go back to school at 38 years old to pursue a diploma in Documentary Photography and Photojournalism at the International Center of Photography (ICP) in New York. Now I am sure it was a good decision but it was a bit intimidating at that time. I returned to Colombia in 2012 after spending four years in New York and in some way it was a nice reencounter, but at the same time a very sad one. I guess Colombia is a country where, as an Italian writer used to say referring to Sicily, “if we want things to stay as they are, things will have to change.” Colombia is like that, an immovable country where a few little changes eventually happen in order to keep everything in the same way: forever still. Over the last three years I went back to Colombia several times to teach photography workshops in different institutions. I guess it is my way to pay my debt to the country and its people. 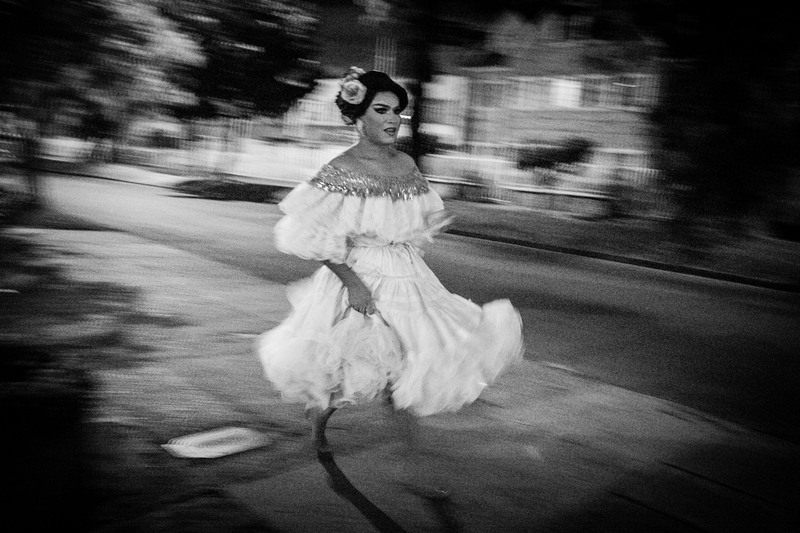 What has drawn your interest to photograph Colombia's LGBT community? Probably my sexual orientation and the desire to investigate how people deal with gender issues and sexual identity/orientation in different countries. Together with the interest to show how a country like Colombia often teaches other countries – including my own, Italy – how people should behave with LGBT population. I experienced much more inclusion and freedom in Colombia than in Italy. In Italy, many people feel they have the right to beat/insult non-heterosexual people, and institutions still perceive us like a bunch of perverse and second-class citizens who may in the future deserve to have some kind of civil unions but without any right to adoption. My country, Italy, is far behind Colombia in term of LGBT’s rights. Having said that, homophobia and hate crimes are still a problem for Colombia’s LGBT community, many of whom seek refuge in the country’s bigger cities, like Bogota, Cali, and Medellin, in order to live their lives more freely. And while gay marriage is technically permitted in Colombia, homosexual couples have faced opposition from conservative groups. In the last years I have focused on events that - like the National Bambuco Gay Pageant or Miss Gay Internacional - are intended to build respect, freedom and tolerance for Colombia’s LGBT community in order to create a more inclusive society where it is hoped that one day diversity will be an element of richness for the nation and will no longer be perceived like a threat to be feared. 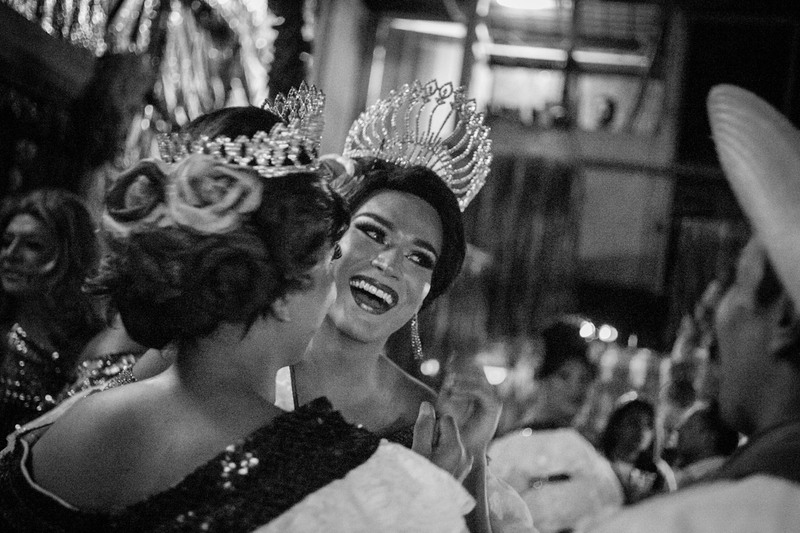 Through your Arts & Culture winning series, Dancing Like a Woman, as well as the shortlisted series, Miss Gay International, it seems you use your photographic style to emphasise the impacts such events look to make on society's perceptions of the LGBT community. How would you say you approached these series photographically? What is it you hope your viewers will take away from the works? I don’t go to this kind of events with a clear, preconceived idea about what I want to get out of them. I always try to work with the flow of the night, letting me be surprised by what is going to happen. Nevertheless, I always try to reveal the naturalness of non-heterosexual gesture, posture, and behaviours. I never ask people to pose for me and when they do – like sometimes happen during beauty pageants – I don’t take the photo. 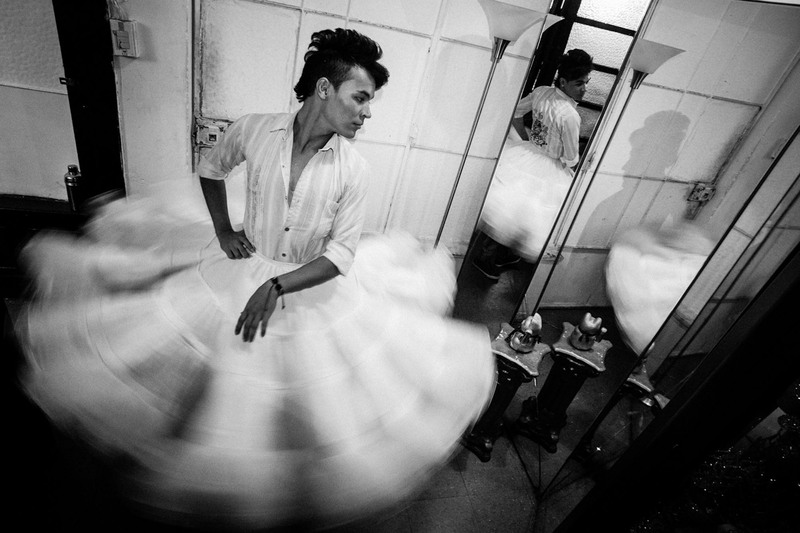 I try to disappear, to be invisible and allow people to forget about my camera and me… In the series shot during Miss Gay Internacional, I played a lot with the mirrors in the backstage in order to avoid posed photographs, trying to ‘confuse’ my subjects that didn’t know what or who I was photographing. 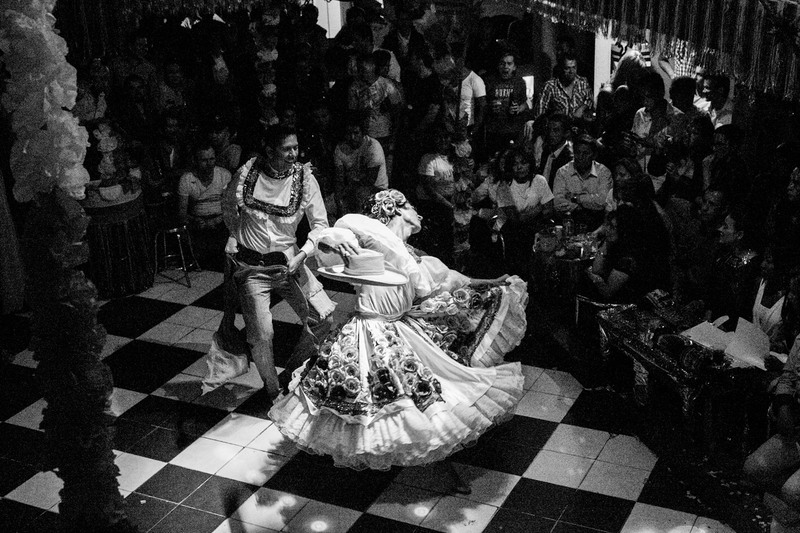 About the Dancing Like a Woman series, what I tried was to give a sense of what happens in this kind of exceptional event when a group of men dress like women and perform a folkloric, high-stylised, love dance - breaking rules and inventing new ones. 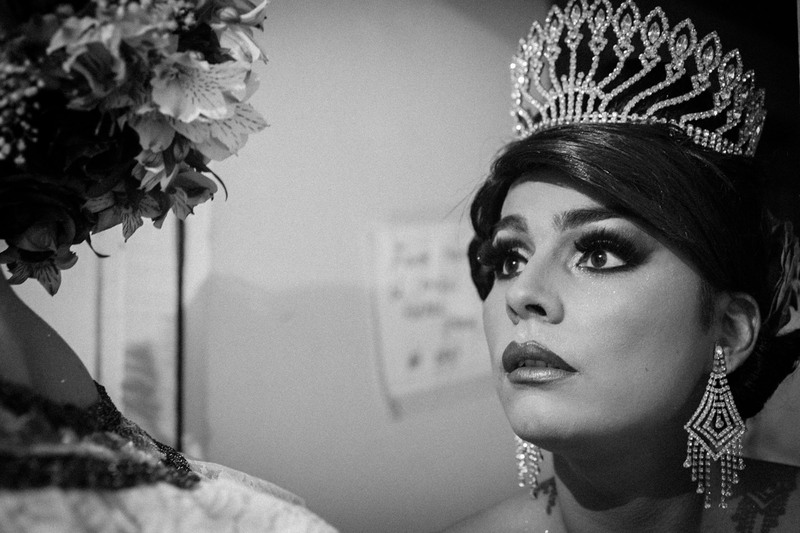 When a beauty pageant is able to question gender and society’s rules and stereotypes in such a traditional, dogmatic and catholic nation like Colombia, I think is important to photograph it in order to help to fight the stigma that many LGBT people still face in so many countries. Many of your past works seem to focus on exploring cultural or social niches within society. What would you say is the common string throughout the projects on which you choose to focus? I like to focus on people that for different reasons – cultural/social/economic background, religious beliefs, sexual orientation – don’t belong to the majority. I also have a special interest in places that show us our vulnerability as human beings and the unequal struggle that we daily conduct against time and nature. During the last three years I spent in Colombia, I have explored and photographed cemeteries all around the country. Finally, I love street photography. Exploring a new place/city without any pre-established idea and reacting to what I see by taking photographs. It is what I am doing in Urban Labyrinths, my last photographic journey through different metropolis in Europe and America. While your topics of interest range widely, the style, feel and narrative directions all seem to align perfectly. Do you have a formula - if you will - for the ways in which you present your stories, or a specific approach that remains consistent when approaching your next project? Most of my creative process is quite unconscious, especially when I am on the streets of a new place/city or in a new community and I respond to it in an emotional and visual rather than an intellectual way. I think in the last four-five years I developed a more personal, maybe ‘cinematic’ style, by working a lot, developing my rolls of film and scanning them in order to learn from my mistakes. Aristotle used to say that: “We are what we repeatedly do. Excellence, therefore, is not an act, but a habit.” I associate being a photographer with being an athlete who trains everyday aiming to get better, and for me the training could also be without a camera, just learning to look at things and light in order to define and discover my own vision. I don’t have a formula; I just try to evoke things rather than to show them. Do you have any upcoming projects that we should look out for? I just came back from Colombia where I started photographing the tragic and complex issue of displacement in the country. I hope I will find the time and economic resources to keep investigating and documenting a problem that today affects almost six million Colombians, more than 10% of the entire population. I am also putting together a book about Infierno Paradisiaco, my three year photographic journey into Colombian cemeteries. Can you share with us a bit of your experience with the Sony World Photography Awards? It was a great experience and a big surprise. Before submitting Dancing Like a Woman to the Sony World Photography Awards, I pitched it to different media outlets in Europe and the US, without any response. Generally the photo editors and art directors I reached said they loved the series ‘but….’. I am glad that the judges at the Sony World Photography Awards didn’t stop at ‘but’ and were brave enough to award an unconventional, never seen before series.